The Herb Garden – Dig Delve – An online magazine about gardens, landscape, growing & making. When we arrived here eight years ago, the fields lapped up to the yard at the front. Immediately to the west of the house a run of increasingly decrepit lean-tos made from a haphazard mix of cinder block, brick, stone and corrugated sheeting extended a semblance of domesticity along the slope. A rubble wall held back the track above and, along it, the structures made their way out towards the barns in stops and starts that charted their thrifty evolution; a scullery, an almost outside loo in a stone lean-to, then through a door into the original bathroom. Stand up washes at the sink in the winter, surely, as there was no evidence of heat. A recycled Victorian door then opened into a corrugated tin building where the coal had been stored and then finally, built onto the front of this, the piggery. Every room had a raking floor, pitching at some degrees down the slope. A seedling oak sprung from the brick floor of the coalhouse, the holes under the doors obviously big enough for squirrels or a rat, perhaps, who was planning a return visit, but never made it. Our first project, the kitchen garden, lay beyond the reach of the lean-tos up around the barns. Several years ago we levelled the ground here in order to make the gardening easier. Two staggered troughs went in on this datum at the same time, echoing the horizontal line of beech on Freezing Hill in the distance and creating an informal gateway to the kitchen garden. By separating the kitchen garden off, when the lean-tos were demolished, we had a new garden space between the end of the house and the troughs. During building it was an area we had to traverse with caution, as it became more and more building site, with deep ruts, bonfires, rubble piles and the remains of the slope. Although we had to knock down the lean-tos, we repaired and rebuilt the stone building that had previously been the pantry. The rubble wall now stood in splendid isolation, naked but shadowed with the ghosts of each of the buildings that had run along it. The tiles of the old bathroom, the blackened coal house and then, finally, a raggedy end up by the piggery. Word had it that ‘Mother’ had once had a vegetable garden on these slopes immediately beyond the piggery and, with the buildings gone, it was clear that this would be the space for the herb garden. A concrete pad was poured alongside the rubble wall in preparation for an open barn that would become our inside outside space and, in the summer of 2016, with the builders gone, we made a start to reclaim the ground. A cut was required to make the level between the house and the troughs, and the fill from the cut was used to extend the level out and down to form banks that rolled into the field. Where the rubble wall ran out, we extended a breezeblock wall to hold back the banks that had been held together with sheet tin and bedsteads, and the remains of a hedge that was mostly elder and bramble with a couple of sickly plums. I replaced the hedge on top of the new wall, mingling hawthorn with eglantine for its scented foliage, and with wild privet and box for evergreen. Lonicera periclymenum ‘Sweet Sue’ – a short growing form of our native honeysuckle selected by Roy Lancaster, has been added along its length. The wall faces south and heats up in the day to throw the perfume back at night. I planted wild strawberries at the base of the hedge so we have easy pickings at shoulder height on the way to the steps. The perfume from the strawberries has been incredible during this recent run of long, hot days. A set of new cast concrete steps sit half way along the wall and flare at the top where a landing forms a viewing platform. From here you can survey the kitchen garden to the west and this new space alongside the house. The concrete pour into a shuttered wooden framework took some engineering, but the steps have weight and their gravity is needed where they sit in the space between the troughs. We grow artichokes and the rhubarb here. Plants that need room. The herb garden was a working title that has stuck. The actual herb beds are a pair of narrow raised beds up by the open barn where we can easily pick the annual herbs that like the morning shade thrown by the building. Coriander, dill, wild rocket, coriander, chervil and parsley, but not basil which needs the all-day heat that lies beyond in the kitchen garden. Further out the perennial herb bed gets the sun and provides us with sage, rosemary, thyme, marjoram, tarragon, summer and winter savory, sorrel and the like. Mint is contained in a pair of old zinc washing dollies in the shade of the building, where it stays lusher and leafier. The extent of the planted area between here and the troughs had to be carefully re-soiled once the cut into the land was made into subsoil. I left it fallow the winter before last, as I wanted to see how easily it drained, since the ‘herb garden’ was where I wanted to grow my lavenders and salvias and other plants that associated well alongside them. I am pleased I did, because while the soil was settling down it drained very badly, puddling in the winter. I thought I was going to have to reconsider my palette, but couldn’t think of anywhere the lavenders would feel as right. It was only when the spring sun dried the soil out and natural fissures opened up in our clay subsoil that it started to behave as I wanted it to. I planted last spring, late in April once the first phase of the main garden was in and mulched. The cut-leaved Ficus afghanistanica ‘Ice Crystal’ was planted close to the bottom of the steps to create a narrowing and a shaded exit point. Though not selected for fruit – they are small and sweet when they come, but require prolonged heat to ripen – I like the fineness of the dissected foliage immensely and, although I have never seen a large plant, I expect it not to take over as figs tend to when they like you. The willow-leaved bay, Laurus nobilis ‘Angustifolius’ anchors the inside corner nearest the house. With elegant, narrow foliage this bay also has a lightness about it. I will keep it loosely clipped into a dome at about shoulder height when, one day, it assumes its position. 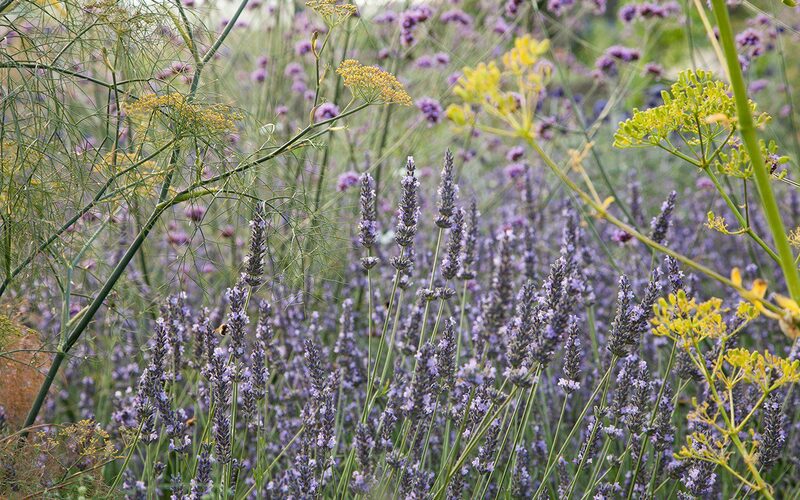 I trialled three different lavenders in the old garden in anticipation of this planting. Lavandula x intermedia ‘Grosso’, a variety used in perfumery in France for its high production of essential oils. I liked it very much. 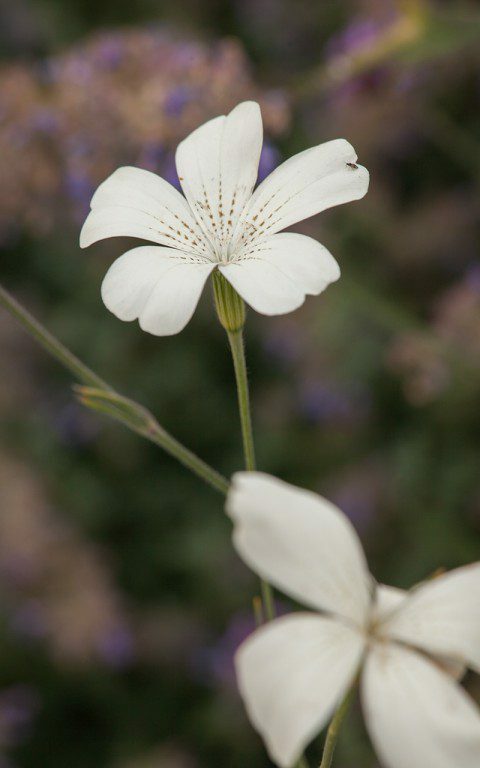 It has good, strong colour and certainly good perfume, but the plants splayed under their weight when in full flower. 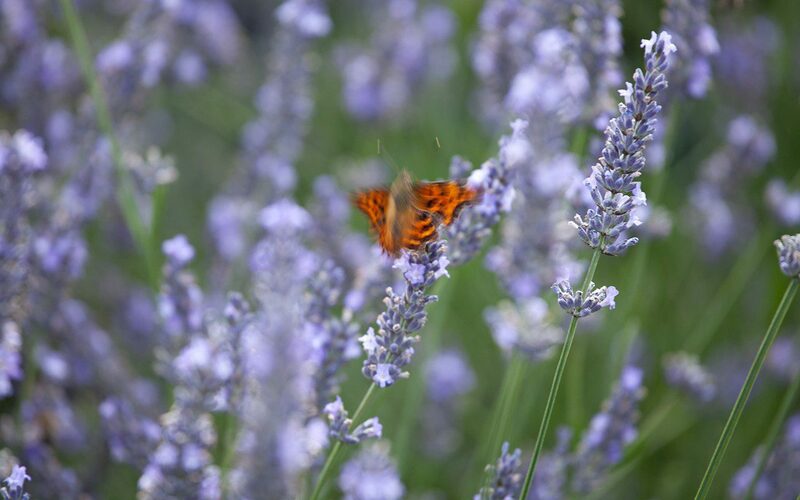 The best time to harvest lavender for the oil is when the first flowers on the spike are just out, so good for perfumery, but not so good for the garden. L. x intermedia ‘Edelweiss’ came a close second with a camphor tang to the perfume and beautiful white flowers that were much loved by the bees, but they proved to be erratic here, with too many plants failing in winter making me lose confidence in committing to it. Our wet West Country weather was probably their downfall. Not L. x intermedia ‘Sussex’ which, though not as dark as ‘Grosso’, is good in every other respect. Tall, long flower spikes and a good form to the plant that, so far, has proven reliable here. 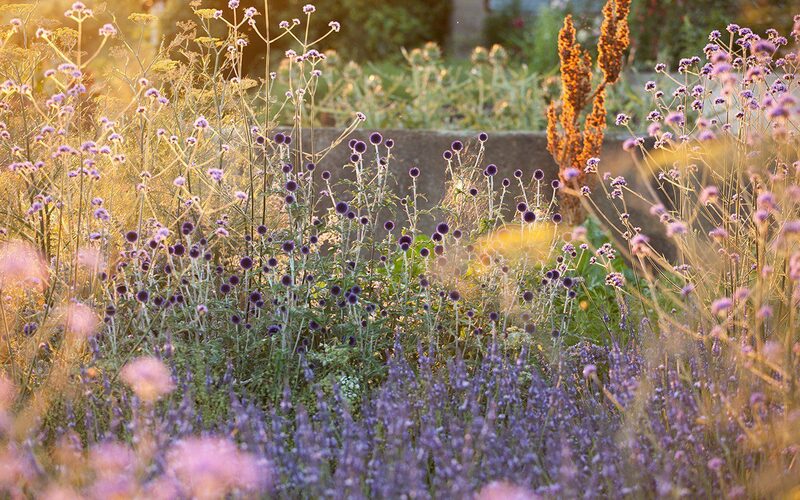 So, the lavender form the backbone of the planting, thirty plants staggering their way across the space, but with openings left for light-footed emergents; Verbena bonariensis – only here and nowhere else for fear of overuse – and bronze fennel, just five plants to keep the airiness in the planting. I’ve direct sown the acid yellow Ridolfia segetum, bone white corncockle Agrostemma githago ‘Ocean Pearl’ and white Ammi majus to lighten the palette. The sparkle is important amongst the mauves. 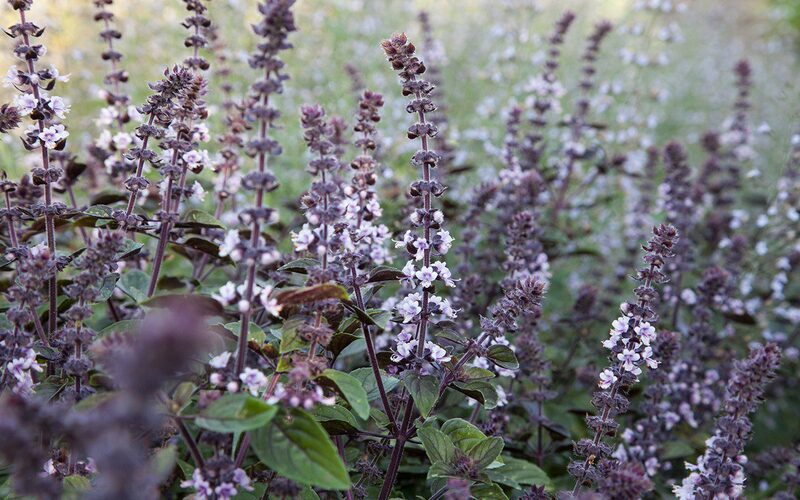 A darker counterpoint is provided by the purple spires of Basil ‘African Blue’, pot-grown nursery plants that we plant out yearly as annuals. Rising up in this second year are the Opopanax chironium. A herb used for the incense resin that is extracted from the dried sap, this is another of the many umbellifers gifted to me by Fergus Garrett at Great Dixter. 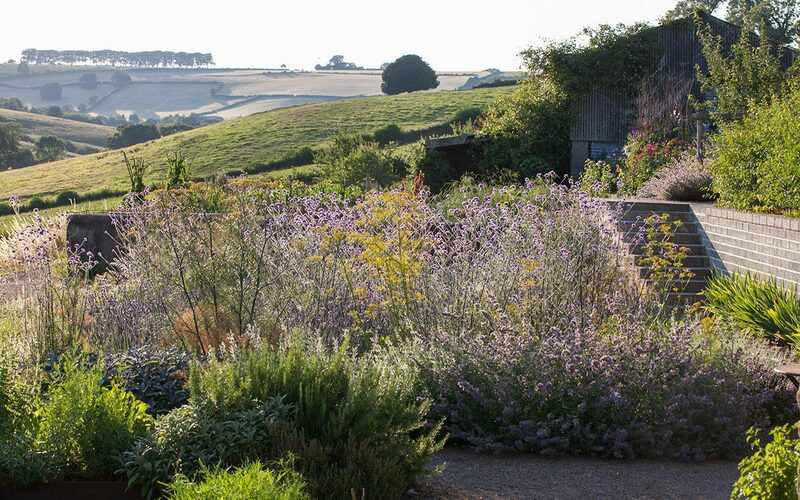 Though they have yet to flower here, the Giant Fennel, Ferula communis, are planted towards the edges of the bed so that it doesn’t overshadow the lavender with its early growth. I hope to see them bolt skyward next year, but for the early part of the growing season their netted leaves have been wonderful. I wanted this planting to have unity but, like the cloudscape it resembles, I also wanted to be able to find the shifts in tone and form. The palette of recessive mauves and blues also allows us the long view here, which is most important because the planting is all too often eclipsed by what is going on in the sky. 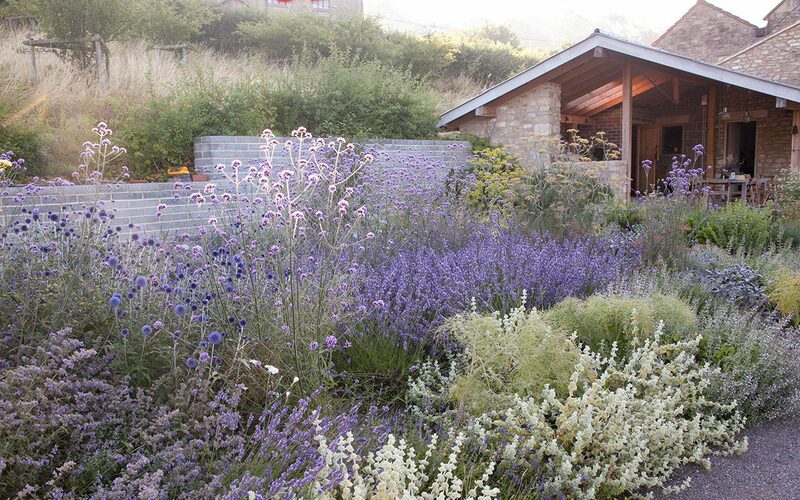 I have built on the insect life that the lavender attracts with Nepeta ‘Six Hills Giant’, which is alive with bumblebees from the moment it starts flowering in April. 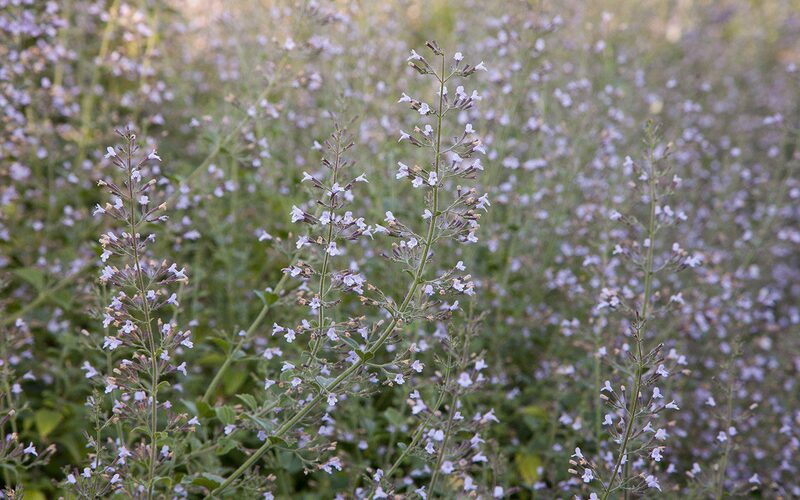 The smaller in scale Calamintha nepeta ‘Blue Cloud’ is delicious by the path where, if you brush against it, you are rewarded with fresh menthol mintiness. 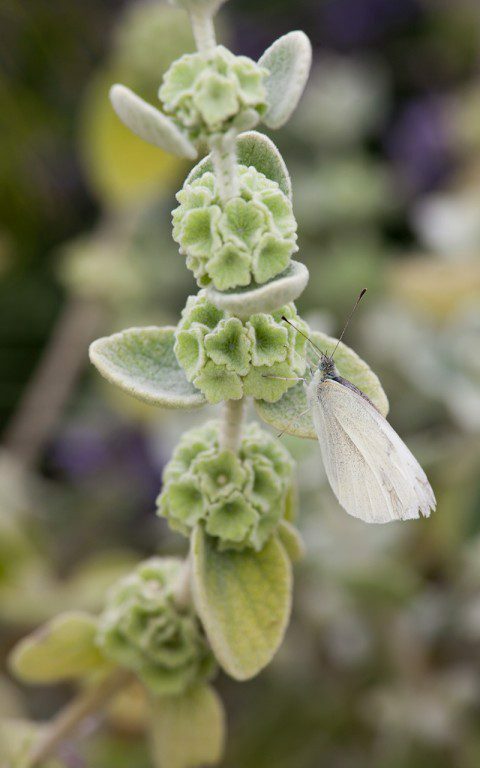 The calamint comes later than the catmint and shortly after the Salvia greggii ‘Blue Note’, which starts into flower the last week in June. 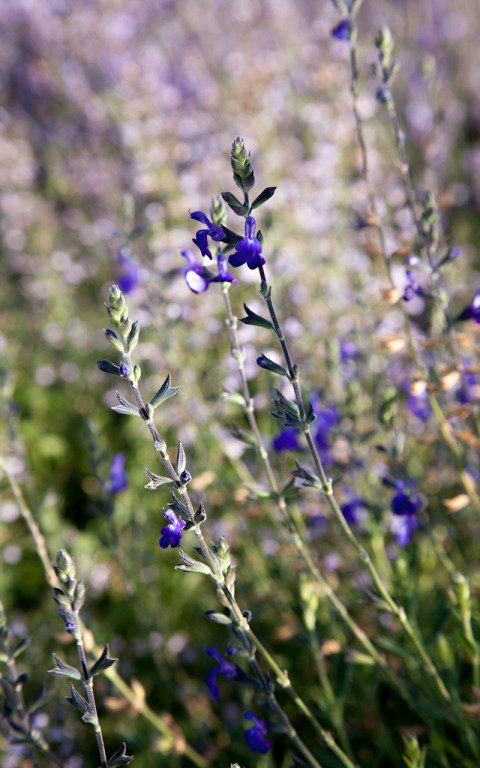 Its spicily scented leaves and flower spikes are sticky with essential oils and the deeply saturated indigo flowers are neverending from now until the frost. 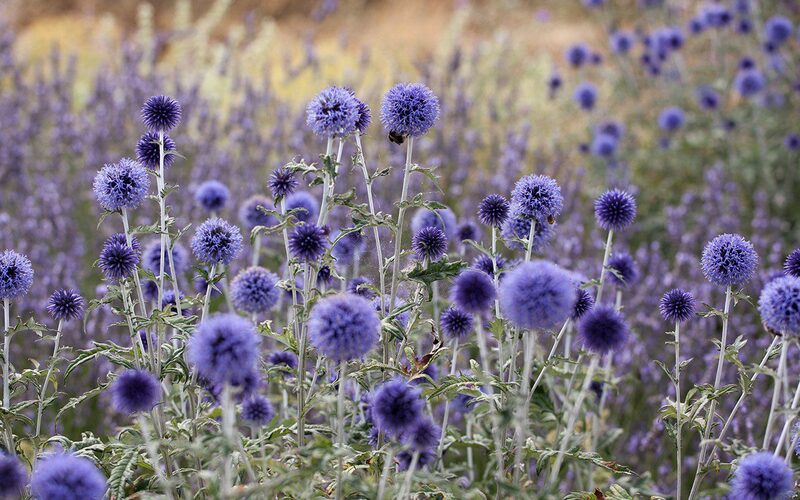 The rich blue globes of Echinops ritro ‘Veitch’s Blue’ run through the planting and, along with the verbena, are the biggest draw for butterflies. 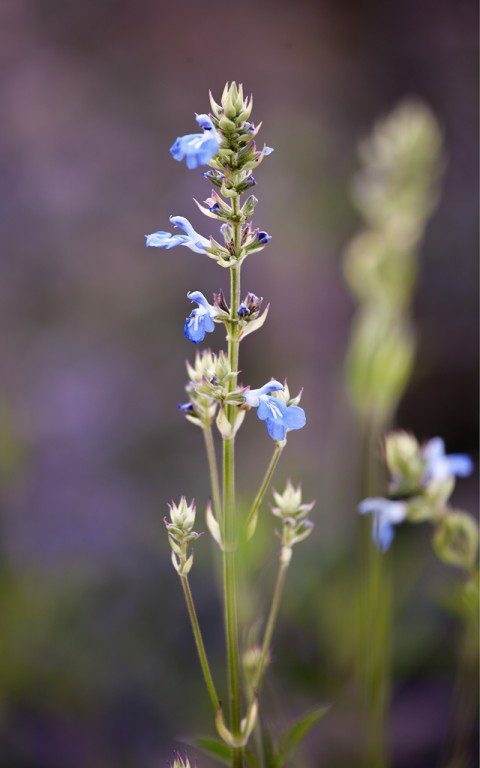 Just starting now the cool blue spires of Salvia uliginosa continue the nectar flow until the first frosts. 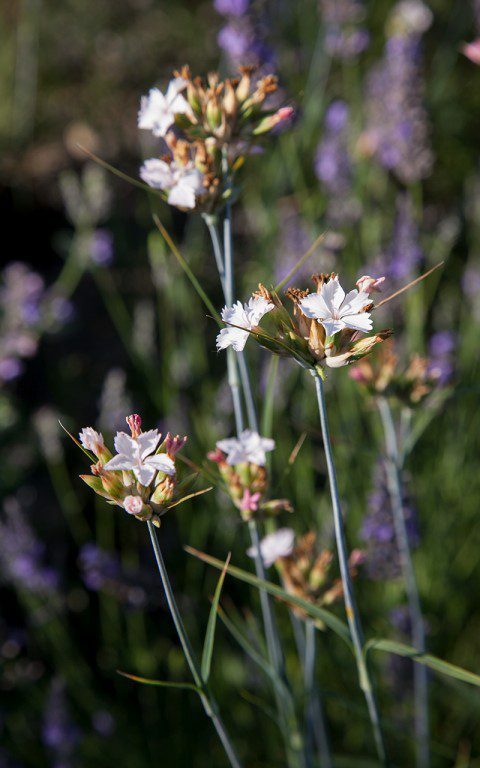 There are incidentals to be found in the undercurrent; Dianthus ‘Miss Farrow’, a D. carthusianorum selection with tiny pinpricks of palest pink flower, and floaty Linum perenne, which brings an underwater movement. 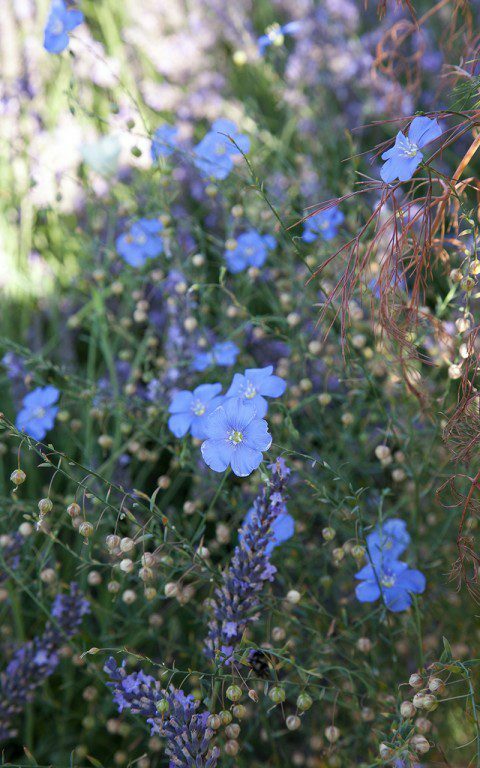 I hope it seeds this year as we could have more for the cleanliness of its sky-blue flower. The lavender will be cut in the last week of the school holidays or thereabouts so that it has time to regenerate before winter. This year I will also be cutting the verbena and fennel before winter to avoid the million seedlings which made their home in the gravel mulch this spring. By then I will be pleased to see the sharp line of the troughs again with the long view of Freezing Hill echoing their horizontal.